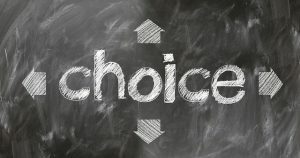 Over the course of my life, I have been in similar situations where I needed to choose how I was going to handle a particular decision. While the severity of the situation varied, there was always one fact that remained: I had choices. I learned, that when I create options, and then choose one of them, I empower myself. I don’t have to like all of the options, I just need to choose the one I think is my best option at that moment in time. I found, that if I was willing to think through the issue and come up with a few alternatives, I could empower myself in practically every situation I encountered. With one caveat: I had to be willing to take 100% responsibility for myself, my decisions, my successes, and my failures. If I choose to blame others for the results I am getting in my life, If I place responsibility for my happiness on anyone else other than myself, I am choosing to be a victim with a victim mindset. Most victims are unhappy because they fail to see that regardless of the situation, they have the power to choose something different. Different may be a different way of looking at a situation, letting go instead of holding on to something, some one, or a situation that is making them miserable, or the fear of moving into an unknown situation. So how can you feel more empowered? Below is a list of 10 questions you can ask yourself in a few given situations that can help. Do I need to be right or do I want to be happy? Do I need to insert myself into this situation or do I need to mind my own business (and this is none of my business)? Do I need to focus on what I must do to make things right or do I want to prove someone else wrong? Do I need to empower myself or do I want to give my power away (letting someone else’s actions or words determine how I think, feel, or act)? Do I want to waste my time being angry and resentful or do I need to forgive and move on (a friend once told me that holding on to resentment is like taking a poisonous pill and waiting for the other person to die)? Do I want to stress out and worry about the outcome or do I trust the process to unfold the way it is (confusing the facts and what it is versus what I want it to be)? Do I want to focus on the past/worry about the future or do I need to live in the present moment? Do I want to focus on the problem or focus on a solution? Do I need to create peace or do I want to create chaos (yes, some people are addicted to drama and chaos)? If this was my last day on earth, would I spend my time and energy on this particular situation, problem, or challenge in this exact same way or would I handle it differently? The whole idea is to stop yourself and make a conscious decision of how you want to live in that moment. Why? Because how you choose to live in each moment determines how you live each day …. How you choose to live each day determines how you live each week … which determines how you live each month … which determines …. well I think you get the idea. Creating choices and deciding how you want to respond, who you want to be, or what you want to do, will determine your level of success and overall happiness in your business and in your life. You just have to remember that the power to em-power yourself lies within and begins when you start to create choices. The more choices you can think of … the more empowered you will feel! Of course this list is incomplete, so feel free to comment with choices you have made that help you to empower yourself. Who knows … something you share may inspire someone else to do the same. Now wouldn’t that be empowering? PreviousPrevious post:The Missing Key to Leading OthersNextNext post:Forgiveness: Elephants Can Forget!